Two descendents of two of the greatest names in the art world – Pierre August Renoir, one of the founders of Impressionism, and Henri Matisse, called “the father of modern art,” appeared at an exclusive “Legacy of the Masters” show May 28-30 at Ocean Galleries in Stone Harbor. Alexandre Renoir and Pierre Henri Matisse – contemporary artists who have made their marks in the art world in their own right – presented their latest paintings for sale and spoke about their legendary family members. According to Ocean Galleries owner Josh Miller, the show was a “once-in-a-lifetime” experience. Alexandre Renoir is the great-grandson of Pierre Auguste Renoir, and Pierre Henri Matisse is the grandson of Henri Matisse and son of sculptor Jean Matisse. Besides featuring the works of the visiting guest artists and those of their famous forefathers, the “Legacy of the Masters” event also showcased the works of museum masters Pablo Picasso and Marc Chagall. The iconic Peter Max brought his colorful and expressive collection of artwork to the Jersey Shore this summer, just in time for the Fourth of July holiday weekend. Ocean Galleries welcomed Peter Max and his extraordinary “Summer to the Max” art exhibition to the Stone Harbor gallery on Sat., July 3 and Sun., July 4. 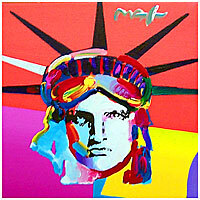 The “Summer to the Max” exhibition featured over 100 pieces of Peter Max artwork, including original paintings, drawings, and limited-edition prints. In addition to his famous patriotic works and well-known cosmic images, the collection included numerous new images of South Jersey beach scenes that Max created specifically for the Ocean Galleries event, such as lifeboat, sailboat, and nature images. 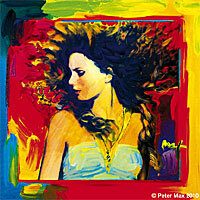 As a special treat, guests enjoyed a recent portrait of Taylor Swift by Max, which was on display July 3 and July 4 only. A longtime fan of Max’s, Swift vacationed in Stone Harbor with her family every summer and remembered the excitement of the Peter Max shows at Ocean Galleries along with his artwork. Swift’s first stage appearance took place at Henny’s Restaurant on Third Avenue just steps away from Ocean Galleries. The world’s premier marine life artist, Wyland, was at Ocean Galleries for the first time in July with a special summer exhibition. The internationally acclaimed artist brought his collection of bronze sculptures and aquatic paintings to the Stone Harbor gallery on Sat., July 24 and Sun., July 25. During the two-day exhibition, Wyland made appearances at guest receptions on Saturday and Sunday. Patrons had the opportunity to meet the artist, who signed and personalized Wyland artwork purchases. Few artists in history can match the influence of Wyland, who has earned the distinction as one of America’s most unique creative artists and has become a leading advocate for marine resource conservation. An accomplished painter, sculptor, underwater explorer, photographer, filmmaker, and educator, he has traveled the farthest reaches of the globe for more than 30 years, capturing the raw power and beauty of the aquatic universe. 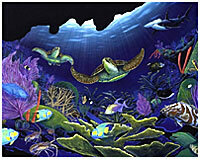 Wyland’s vision is to create global awareness for the ocean’s magnificent marine life through paintings, sculpture, public art and education, and ocean exploration. Widely-collected palette-knife painter S. Sam Park was at Ocean Galleries Labor Day weekend to open his new exhibition, “Romance with the Sea … and other favorite places in my journeys,” a collection of seaside and landscape paintings inspired by his worldwide travels. 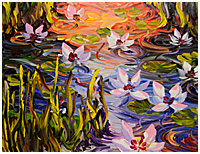 The exhibition featured more than 100 pieces of artwork, including original paintings, drawings and limited-edition prints. Also on display was several rare paintings, including embellished graphics on canvas. In conjunction with the exhibit, Ocean Galleries hosted a fundraiser for the Comcast-Spectacor Foundation, the charitable arm of the Philadelphia-based sports and entertainment firm Comcast-Spectacor. 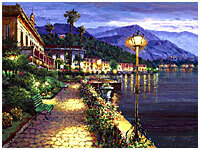 Park and Ocean Galleries donated the proceeds from the auctioning of two gicleés, “La Pergola” and “Afternoon on the Canal,” paintings that depict European water and street scenes. Award-winning sports personality Neil Hartman, of Comcast SportsNet, served as guest auctioneer. Born in 1949 in Seoul, Korea, Park began painting at the age of 12. After graduating from Jung Ang University, he gravitated toward Impressionism and Hyperrealism, and continued to develop his skills while living in France and Greece. In 1984, he won the gold medal at the national Olympic-sponsored art competition for the 1988 Seoul Olympics. In 1994, Park relocated to southern California.